Please feel free to take a virtual tour through our funeral home via our website. Our funeral home is the largest in the Dolgeville, Oppenheim and Ephratah areas. Our facility can accommodate over 250 people with more comfort for our larger families we serve. yet in the same regards it is an intimate and personal atmosphere. All together, our funeral home offers many qualities to serve your family during a time of need. The funeral home features a fireplace, 18 foot ceilings, a private sitting area, a large spacious chapel and overflow room to accommodate 250+ people, two full handicap accessible bathrooms, a ramp, and plenty of off-street parking around the building and across the street. Overall, our funeral home is a state of the art, brand-new facility. Please stop by and see what we have to offer. 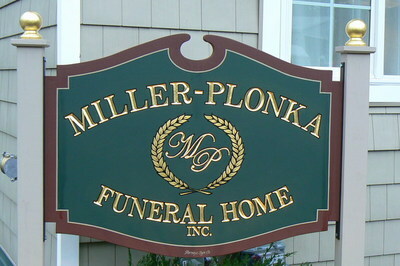 Before the Miller-Plonka Funeral Home bought the building on 30 Wolf Street, Dolgeville, it was an Agway building operated by a local businessman. In September of 2006, Noelle discovered this building on the real estate market and thought it had a lot of potential, a diamond in the rough. As Noelle and her family purchased the building, they found out what a gem the place really was. They worked as much as he could to open the building up and found many beautiful attributes the place offered, one of which included a post and beam infrastructure. In the process, they also built cathedral ceilings. Now, the funeral home showcases these 18 foot cathedral ceilings in their chapel area. It is one of the many attributes the building has to offer. "Let Our Family Serve Your Family"